Bones are the third most common location where cancer cells spread and metastasize.3 Each year, about 100,000 cases of bone metastasis are reported in the United States.2 Bone metastases occur when cancer cells gain access to the blood stream, reach the bone marrow, begin to multiply and then grow new blood vessels to obtain oxygen and food—which in turn causes the cancer cells to grow more and spread. Some bone metastases become painful because the tumor eats away at the bone, creating holes that make the bone thin and weak. As the bones are replaced with tumor, nerve endings in and around the bone send pain signals to the brain. If left untreated, bone metastases can eventually cause the bone to fracture—seriously affecting a patient’s quality of life.2 This is particularly true for long bones of the extremities where a fracture may render a limb nonfunctional. These patients may require surgical intervention to restore the function of their limbs. More commonly, metastases involve the ribs, pelvis, and spine. For the most part, the goal of treating bone tumors is not curative, but rather palliative by reducing pain, preventing additional bone destruction, and improving function. In treating cancer patients with painful bone metastases, interventional radiologists may use a form of treatment called kyphoplasty or vertebroplasty. Spinal tumors are abnormal growths of tissue found inside the spinal column. Primary tumors originate in the spine and are caused by uncontrollable growth among cells that reside in the spinal column or neural tissues. Considered rare, primary tumors of the spine can be benign or malignant and their cause is unknown. Secondary tumors are ones which spread to the spine from some other part of the body. Most often times, the primary cause of these tumors is breast, lung and kidney cancers. Tumors which arise or spread to the spine present some of the most difficult challenges for patients and physicians as they can cause several types of problems. First, the tumor may weaken the bone, causing it to fracture and collapse. As a result, the patient suffers severe pain from excess pressure on nerves or the spinal cord. Additionally, the tumor can expand outside the bone, also causing pressure on nerves or the spinal cord. And finally, some tumors can cause the bone to expand, similarly placing pressure on surrounding tissues. The primary symptom of a spinal tumor, and the one that brings most patients to the doctor’s office, is non-mechanical back pain. Non-mechanical back pain is constant and does not improve with rest or lying down. Mechanical back pain, on the other hand, is most often caused by muscle strains or disc injury and usually worsens with activities such as sitting, bending, and walking. It does improve with rest or lying down. Other symptoms of spinal tumors may include sciatica, numbness, partial paralysis, spinal deformity, difficulty with bladder control and fever. These symptoms generally develop slowly and worsen over time unless they are treated. Depending on the type of tumor and the symptoms it is causing, different treatments can be used to treat vertebral body tumors. If there is collapse of the bone, a procedure called vertebroplasty may be performed by inserting a needle through the skin into the bone using x-ray guidance and injecting cement to strengthen the bone. If the tumor causes pressure on nerves or the spinal cord, surgery may be considered. 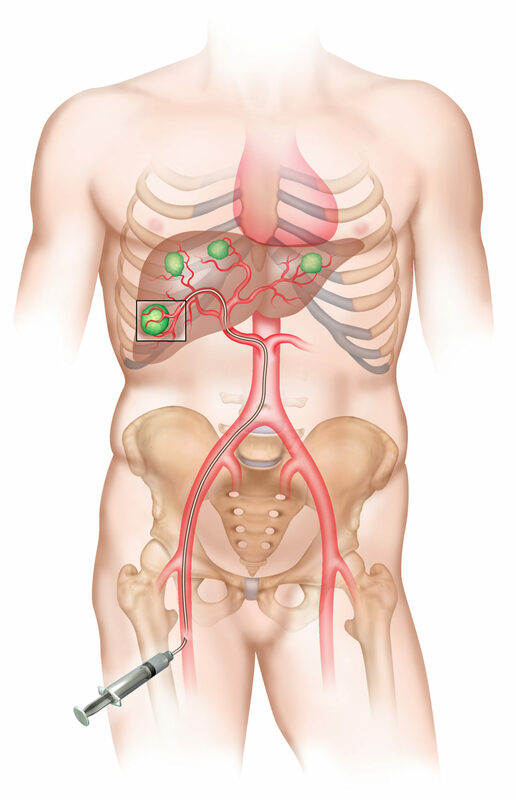 In the event that the tumor has a large blood supply, which can complicate surgery, endovascular techniques may be employed by inserting a catheter into the blood vessels supplying the tumor and injecting materials to block off the blood supply to the mass. This procedure, called embolization, is usually performed within a few days of the impending surgery. If surgery is not recommended or possible, embolization may be performed to shrink the tumor. In some cases, a needle can be placed directly into the tumor using x-ray guidance and material can be injected to kill the tumor. Some tumors are best treated with radiation therapy. In the United States, a woman is diagnosed with breast cancer every three minutes and one woman will die from the disease every 13 minutes.1 For these women, as well the thousands of men diagnosed each year,1 breast cancer treatments can be highly effective, but often require invasive treatment options such as surgery and chemotherapy. Recent advancements in technology and imaging now offer patients more tools to fight breast cancer—minimally invasive treatments known as thermal ablation and laser therapy. Thermal ablation treatment is building on the two-decade trend toward less radical approaches and utilizing local treatments for breast cancer. Due to the cosmetic result of more invasive therapies, treatments that would preserve the greatest amount of normal tissue (breast conservation) have great appeal.5, 7 Although the devices used in radiofrequency ablation, cryoablation and laser therapy are FDA approved, more research and long-term data are needed to determine the role these procedures will have in the fight against breast cancer. Surgery offers the best chance for a cure. Until long-term data are available, interventional treatments are reserved for women who cannot have surgery. As vascular experts, interventional radiologists are uniquely skilled in using the vascular system to deliver targeted treatments via catheter throughout the body. In treating cancer patients, interventional radiologists can attack the cancer tumor from inside the body without medicating or affecting other parts of the body. For breast cancer, interventional radiologists use thermal ablation, as well as some laser therapy, to kill the cancer cells. Although the devices used are FDA approved, research to evaluate the long-term effects of these treatments is still ongoing. Interventional radiologists can also assist with the diagnosis by performing a needle-core biopsy of an abnormal lump. Using imaging for guidance, an interventional radiologist can insert a small needle into the mass and remove a tissue sample, which is given to a pathologist to determine what the cause of the abnormal tissue—cancer, benign tissue, infection, or scar. Patients with invasive breast cancer are at risk for liver cancer. The liver serves as a way-station for cancer cells that circulate through the bloodstream. These cells may grow and form tumors in the liver. It is estimated that as many as 70 percent of all people with uncontrolled cancer will eventually develop secondary liver tumors, or metastases (tumors formed by primary cancer cells that have spread from other cancer sites). Interventional radiologists offer nonsurgical treatments for liver cancer, including embolization to cut off the blood supply to the tumor, radioembolization that delivers radiation directly inside the tumor, and chemoembolization, which delivers the cancer drug directly into the tumor and then cuts off the blood supply. Smoking, heavy alcohol use and Barrett esophagus can increase the risk of developing esophageal cancer. The incidence of kidney cancer is on the rise. Fortunately, the availability of modern imaging technology has led to more frequent detection of small, asymptomatic tumors that otherwise would be undetected. Often, small tumors do not cause symptoms and are discovered on CTs, MRIs or ultrasounds that are performed for some other reason, such as standard imaging studies (CT or ultrasound) performed during many emergency room visits. These small tumors are often the best candidates for nonsurgical treatment options. Advanced renal cell carcinoma tumors are often quite large and invade adjacent structures and veins. They may even extend through the veins into one of the heart chambers. Some patients with advanced tumors may not be surgical candidates. Arterial embolization is an invaluable treatment option for such patients. In some patients, arterial embolization may shrink the tumor substantially, rendering the patient a suitable surgical candidate. In others, arterial embolization effectively eliminates tumor-related symptoms and improves patients’ quality of life. Arterial embolization has also been used to facilitate surgical resection of large tumors. Blocking the blood supply to the tumor decreases the risk of bleeding and minimizes the amount of blood transfusion during surgery. Similarly, arterial embolization can facilitate ablation of larger tumors. Reduction of blood supply to the tumor renders ablation procedures (RFA or cryoablation) safer and more effective. Historically, chemotherapy drugs have been generally ineffective at curing liver cancer. Additionally, interventional radiologists can use imaging to guide them directly to the tumor through the skin to administer radiofrequency heat to “cook” and kill the cancer cells (radiofrequency ablation). This treatment incorporates the radioactive isotope Yttrium-90 into the embolic spheres to deliver radiation directly to the tumor. Each sphere is about the size of five red blood cells in width. These beads are injected through a catheter from the groin into the liver artery supplying the tumor. The beads become lodged within the tumor vessels where they exert their local radiation that causes cell death. This technique allows for a higher, local dose of radiation to be used, without subjecting healthy tissue in the body to the radiation. The Yttrium-90 radiates from within and, since it is administered in the hepatic artery, it can be viewed as “internal” radiation. Radioembolization is a palliative, not a curative, treatment—but patients benefit by extending their lives and improving their quality of life. It is a relatively new therapy that has been effective in treating primary and metastatic liver cancers. It is performed as an outpatient treatment. There are fewer side effects from this treatment compared to standard cancer treatments, with the main one being fatigue for seven to 10 days. For more information on this procedure please click here to read a patient pamphlet. According to the American Cancer Society, about 14,000 cases of primary liver cancer are diagnosed each year. The most common form is hepatocellular carcinoma (HCC). This is a tumor that begins in the main cells of the liver (hepatocytes). Primary liver cancer is twice as common in men as in women. HCC most frequently occurs in those who have a form of liver disease called cirrhosis. Cirrhosis occurs when the liver becomes diseased and develops scarring, usually over a period of years. The liver attempts to repair, or regenerate itself. This process can lead to the formation of tumors. In the United States, the most common causes of cirrhosis are chronic infection with the liver virus hepatitis B or C or alcohol abuse. The incidence of primary hepatocellular carcinoma is on the rise worldwide, because of the increase of hepatitis C.
Normally, cells grow and divide to form new cells as the body needs them. When cells grow old, they die and new cells take their place. Sometimes this orderly process goes awry—that is, new cells form when the body does not need them, and old cells do not die when they should. These extra cells can form a mass of tissue, or tumor. Cancerous tumors are abnormal and divide without control or order. The lung is the most common site for primary cancer worldwide, and smoking tobacco is the leading risk factor.1,5 The lung is also a common site of metastases for various malignancies.1 Metastases occur when a single tumor cell or clump of cells gain access to the blood stream or lymphatic system, travel to a new organ such as the lung, begin to multiply, and then regrow their vascular structure to obtain food. Interventional radiologists can also assist with the diagnosis by performing an image-guided needle biopsy of an abnormal tissue mass. Using CT, ultrasound, MR or X-ray imaging for guidance, an interventional radiologist can insert a small needle into the mass and remove a tissue sample, which is given to a pathologist to determine what is the cause of the abnormal tissue—cancer, benign tissue, infection, or scar. Needle biopsy is typically an outpatient procedure with infrequent complications; for example, less than one percent of patients develop bleeding or infection. In about 90 percent of patients, needle biopsy provides enough tissue for the pathologist to determine the cause of the abnormality. Head and neck cancer is the name given to a variety of malignant tumors that occur in the head and neck region. They may develop in the mouth, throat, sinuses, nasal cavity, larynx or salivary glands. Some experts also include skin cancers such as melanomas (in the throat or nose) under the broad heading of head and neck cancers. Excluding superficial skin cancers, but including cancer of the larynx and thyroid, it is conservatively estimated that about 60,000 people are diagnosed with head and neck cancer annually; about 5% of all cancers diagnosed in the United States. There are approximately half a million survivors of oral, head, and neck cancer living in the United States today. The most common type of malignant tumor in the head and neck region is squamous cell cancer, also known as squamous cell carcinoma. This is due to the fact that the lining of much of the mouth, nose and throat is made up of a type of cell known as squamous cell. When these cells give rise to malignancy, the tumor is called squamous cell carcinoma (abbreviated SCCA). This tumor is most often associated with heavy smoking and/or heavy consumption of alcohol. Early symptoms of head and neck cancer include a sore in the throat that does not heal especially with pain radiating to the ear, a growth in the mouth, a lump in the neck, a cough or hoarseness, a sore throat that does not improve, coughing up blood or bleeding into the throat and nosebleeds. These cancers initially spread into the lymph nodes in the neck. A lump in the neck (enlarged lymph node) that does not go away may be the first indication of a head and neck cancer. Risk factors of head and neck cancer include smoking or chewing tobacco and alcohol use. Leukoplakia (white spots or patches in the mouth) also may be considered a risk factor, as this condition becomes cancerous in approximately one-third of patients. Juvenile nasopharyngeal angiofibromas (JNAs) are tumors that arise at the back of the nose and account for .05% of all head and neck tumors. Typically benign, these tumors are almost always seen in adolescent boys, with the highest incidence rate between seven and 19 years of age. JNAs are rare in patients older than 25 years of age. Given this condition’s predisposition to boys, it is thought that hormones may play a role in its development. Some specialists suggest these tumors are sensitive to hormone levels and stimulated to growth by the onset of puberty. The most common symptom of a juvenile nasopharyngeal angiofibroma is nasal obstruction (occurring in 39 to 90 percent of all cases). These tumors also cause recurrent nosebleeds in 45 to 60 percent of cases. Other symptoms may include sinusitis, otitis (ear infection), loss of sense of smell, facial swelling, headache and double vision. The definitive treatment for juvenile nasopharyngeal tumors is surgical removal. This can be difficult depending on the size of the tumor and where it has spread. Additionally, these tumors usually have a large blood supply, which further complicates surgery. In order to decrease the amount of bleeding during surgery, endovascular treatment can be performed prior to surgery by inserting a catheter into the blood vessels supplying the tumor and injecting materials to block off the blood supply to the tumor. This procedure, called embolization, is usually done within a few days in advance of the impending surgery. Tumors of the head and neck (such as tongue or throat cancer) can cause bleeding into the throat or nosebleeds. Not infrequently, this bleeding can be difficult to control by surgery. When this is the case, endovascular methods can be used to treat these tumors and their bleeding by inserting a catheter into the blood vessels supplying the tumor and injecting materials to block off the blood supply to the tumor. This procedure, called embolization, can also be performed before a scheduled surgery if the surgeon is concerned that the large blood supply to the tumor will make surgery more difficult. Additionally, certain tumors can be treated by placing a catheter into the artery supplying the tumor and injecting chemotherapy drugs directly into the mass, rather than dispensing the drugs intravenously. This treatment option depends on the kind of tumor, its size, and its location.